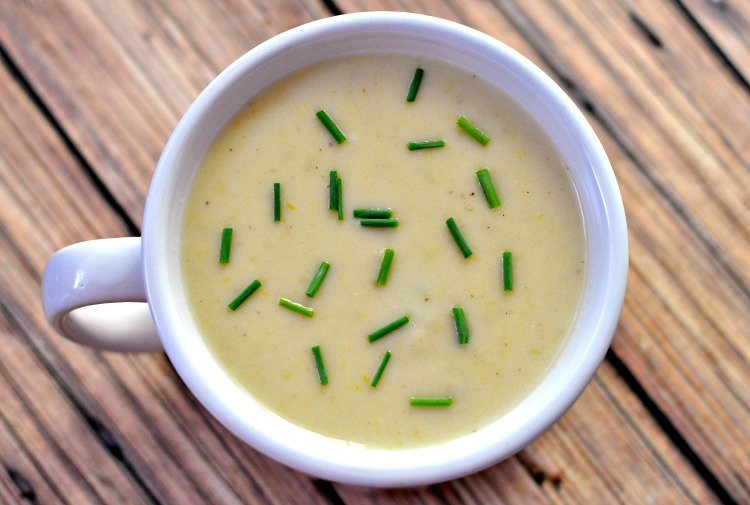 Are you looking for the best Instant Pot Potato Leek Soup recipe? Our recipe is full of flavor and easy to prepare. The kids even approve! Once you start making soup in the Instant Pot, you’ll never go back. Don’t get me wrong, I love making soup in the slow cooker (like my popular Navy Bean Soup), but the Instant Pot is so much faster! Seriously! I had been craving a nice, warm bowl of Potato Leek Soup for a while, but was intimidated by how long it could take. 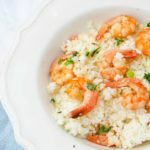 So I decided to experiment with making it in the Instant Pot – I’ll never make it another way again! It’s smooth, creamy and absolutely delicious. And best of all, it only takes about 45 minutes to make it. If you’re looking for a delicious Instant Pot soup recipe, you’re going to love this Potato Leek Soup – it’s the best! 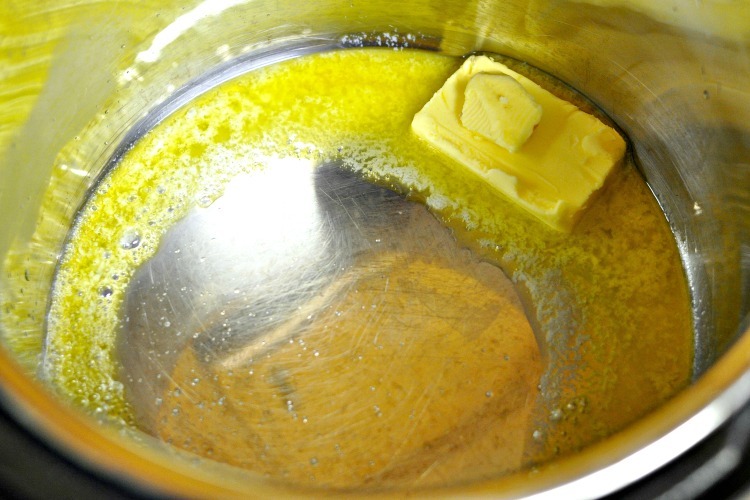 Add the butter to your Instant Pot, then turn on Saute mode and allow the butter to melt. Once the butter is melted, add the leeks and garlic to the Instant Pot, and saute while stirring frequently until everything has softened. It usually takes 8-10 minutes. Next, add the chicken stock, white potatoes, bay leaves, fresh thyme, salt, pepper and garlic powder to the Instant Pot and stir to combine. Place the lid on your Instant Pot, then turn on Soup mode for 15 minutes. Allow the pressure to release naturally. Once the pressure has dissipated, remove the lid from the Instant Pot. Take the thyme stems and bay leaves out of the pan and discard. 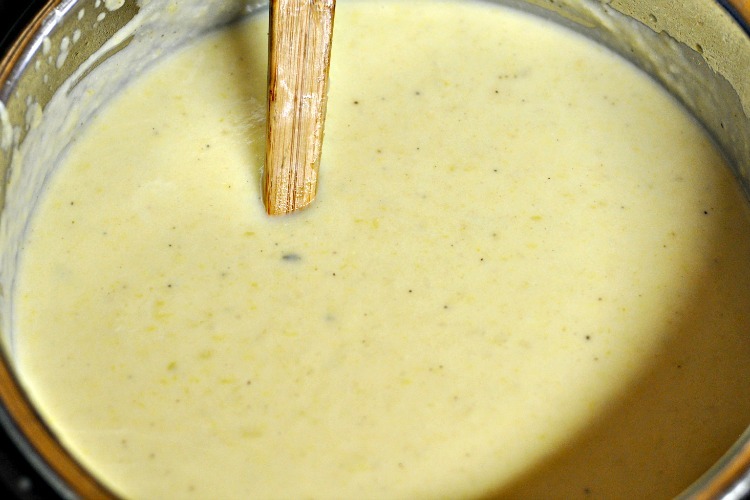 Use an immersion blender to puree your Instant Pot Potato Leek Soup. Once it’s smooth, stir in heavy whipping cream and turn the Instant Pot back on Saute. Allow the soup to come to a gentle simmer, stirring constantly. If it’s too thin, allow it too cook down a bit. If it’s too thick, you can add more chicken stock or heavy whipping cream. Taste and adjust spices, if necessary. 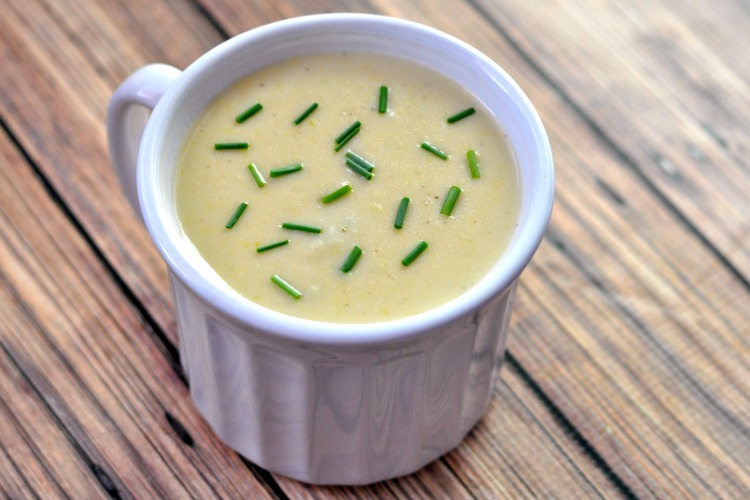 Are you looking for the best Instant Pot Potato Leek Soup recipe? Our recipe is full of flavor and easy to prepare in any pressure cooker. The kids even approve! Once the pressure has dissipated, remove the lid from the Instant Pot. Take the thyme stems and bay leaves out of the pan and discard. Use an immersion blender to puree your Instant Pot Potato Leek Soup. Once it's smooth, stir in heavy whipping cream and turn the Instant Pot back on Saute. 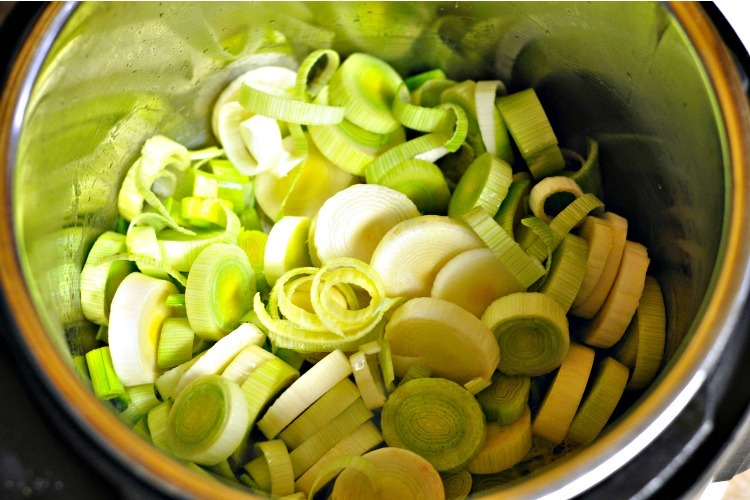 Allow the soup to come to a gentle simmer, stirring constantly. If it's too thin, allow it too cook down a bit. If it's too thick, you can add more chicken stock or heavy whipping cream. Taste and adjust spices, if necessary. Have you made Instant Pot Potato Leek Soup? How did it turn out? 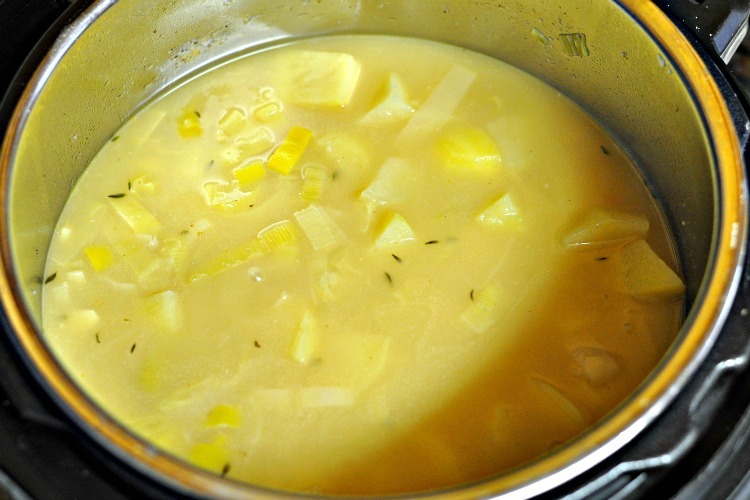 Pin this Instant Pot Potato Leek Soup recipe to your Instant Pot or Soup board! What a great idea to cook it in the Instant Pot. One more reason for me to get one! Thanks for sharing the oh-so-delicious recipe! I love potato soup! Thanks for sharing at the What’s for Dinner party. Pinning this for later…I’m just getting a hang of the Instant Pot and will need to try this. Thanks for linking up with the Blended Blog. I love potato leek soup, and I just got an Instant Pot, so this recipe is perfect for me. Thanks for sharing at Fiesta Friday! 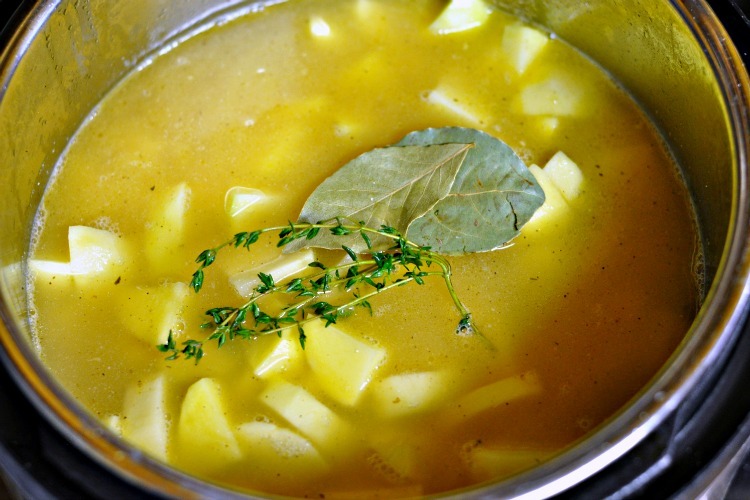 I love a great Potato Leek Soup and your recipe looks awesome! Thanks so much for sharing your post with us at Full Plate Thursday. Have a great week and come back soon! I still have not invested in a insta-pot – I have so many appliances/kitchen gadgets now after collecting for 40 years. The soup looks great and I am sure I could make it on top of the stove or in a slow cooker. Thanks for sharing with Fiesta Friday. Oh, I love my Instant Pot. Thanks for the great recipe! Thanks for sharing at Home Sweet Home. One of our daughters got an instant pot for Christmas and loves it. The soup sounds yummy! Thanks for sharing with Share Your Cup.